Had so much fun with this already, and have barely scratched the surface of stage 2. Mon, 11/04/2013 - 07:12 — Johny L.
Thanks. Nowadays i might learn myself making best games in MMF2. -Famitracker: I don't compose the music for the game, i got loads of FM files from the Famitracker forums and i exported in WAV. -Spesoft Audio Converter: I use the software to convert in OGG in order to lower the file size of the audio file so the game won't take too much time to load. -Audacity: I used to record my voice and then i maxed out to +36 dB and saved it as WAV. -Bfxr: I used this to make my own sound effects for the game. I also made this in 3 or 4 hours in all the afternoon to finish this quickly. This game became a masterpiece too. 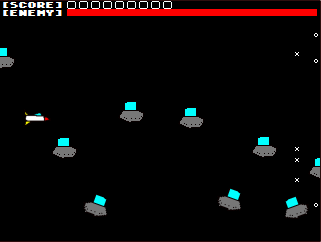 This might be part of my own game series, Retro Pieces: DrBlowhole20's Retro Vault.